Many of us dine in restaurants instead of home significant numbers of time. When your plan to dine at an ethnic cuisine spot, it is tricky to know understand the menu, when we are not familiar with the cuisine. It makes more sense to know what not to choose while dining in such places. Which foods signal higher-fat choices? 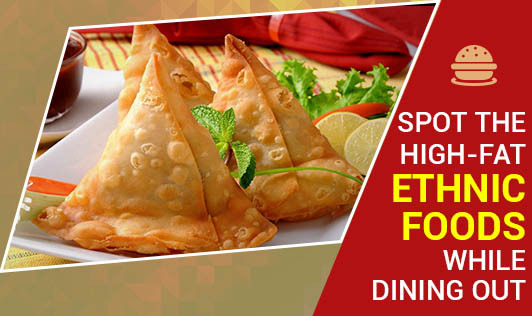 Foods that are deep fried such as samosas, pakoras, bajjis, kachori, papads, etc. In the gravy dishes, like the more famous dishes, chicken tikka masala or paneer tikka masala, the chicken/ paneer pieces are usually grilled, but are then added to a rich creamy sauce, so it's the sauce that is high in the fat content. Curries in general are also rich in cream or coconut milk, so indulge sparingly. A lower-fat choice would be something that is made in tandoor (marinated meat/ paneer/ veg cooked in a special clay oven). Just watch what you dip these tandoor items in. Deep-fried items in Mexican cuisine are hard tacos (including taco salads, which tend to have deep-fried taco shell bowls), tortilla chips that come as a side, tostadas, and chimichangas. You could instead opt for tamales or burritos that are. Be sensible of portion sizes, even for steamed versions, and be wary of "wet" versions of tamales and burritos that are drowning in heavy sauces. We all know that spring rolls are deep-fried. But did you know that many noodle dishes are also high in fat? Chow mein noodles are pre-fried to begin with, and then more oil has to be added during cooking to prevent the noodles from sticking. Items which as a description like "crispy," and ones "with special sauce," will be high in fat as well. Some popular dishes chicken/ veg balls in sauce the chicken/ veg balls are battered and deep-fried before the sauce is added. For lower-fat choices, look for sautéed, braised, or steamed items or noodle soups, and ask for any sauces to be served on the side. Tempura is the well known term for deep fried items in Japanese restaurants. Other items that are often deep-fried include katsu or karaage-style dishes. Yaki soba is pan-fried noodles, which can be quite oily. Safer bets are to request broth-based noodle dishes like ramen and udon, robata or yakitori (grill) items, or just the traditional sushi. Any dish sporting the term "goreng" or "char" in its name signals either a deep-fried or higher-fat choice. Southeast Asian curries are coconut-milk-based too, so enjoy sparingly. It is best to cook your meal from scratch but many of us rely on restaurants or take away options these days and this is a reality. It is good if you learn to spot the higher-fat menu choices so you know how best to manage your fat allowance. "Working the small plates" is also a good option to control your intake. That is, order two or three small appetizers and make that your meal.